The black Teac UD-301-B is a dual monaural digital to analog audio converter designed to provide premium audio reproduction for audiophiles and music connoisseurs in listening rooms, home audio setups, and studios. Its dual mono design uses separate converters and amplifiers for the left and right channels to eliminate crosstalk between channels. High-resolution Burr-Brown converters support PCM audio up to 32-bit / 192 kHz resolution and DSD audio up to 1-bit / 5.6 MHz resolution. Digital signal can be sourced from coaxial, optical, or USB inputs. When streaming via USB, the UD-301-B allows jitter-reducing asynchronous transmission, which uses the internal clock to adjust and stabilize the timing of the input signal. Balanced XLR and unbalanced RCA analog outputs are available on the back panel. Their levels can be set to fixed, variable, or off via a 3-position switch. The front-panel 1/4” headphone jack utilizes a motor-driven volume knob for smooth level adjustment. Box Dimensions (LxWxH) 15.0 x 13.4 x 6.3"
The Teac has a motor-driven knob. Does this imply I can purchase a remote control for the volume control? 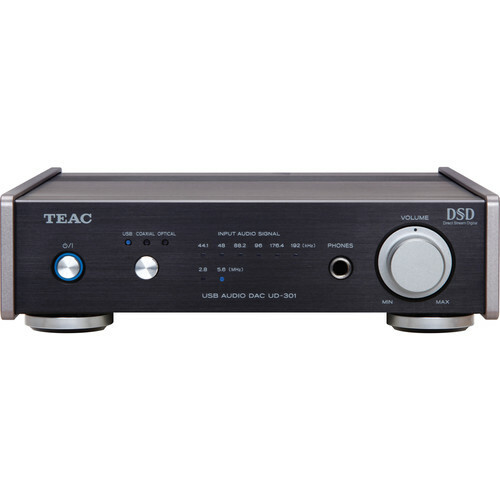 The inside scoop from Teac is this is the same volume know used with the Teac AI-301DA. These two units have similar physical traits, but the remote feature is available for the AI-301DA (B&amp;H# TEAI301DAB) only.